Though several automakers have celebrated their centenary recently, most haven't been around that long. Ford has, though, and not only that, it's been in the UK for 100 years, too. The Blue Oval has set to staging a series of celebrations to mark the occasion, culminating in the Ford Centenary Tour traversing the British Isles. 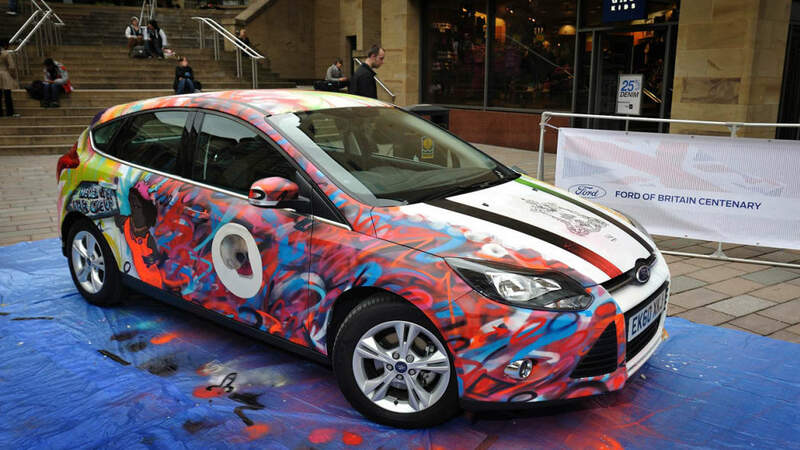 The celebratory road trip started in London last week and will end on September 18 at the Goodwood Revival, but on its way, it swung through Glasgow, Scotland, where Ford commissioned a group of artists to repaint the Focus in their own style. 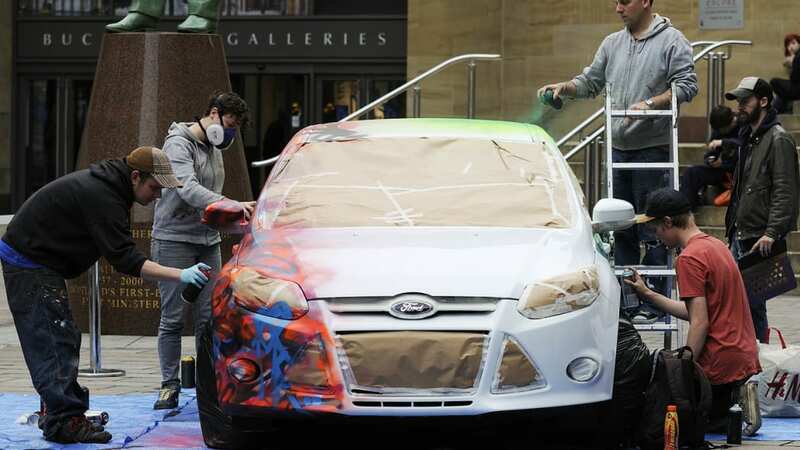 The six graffiti artists affiliated with the Recoat Gallery installed themselves in downtown Glasgow and repainted the car in front of a gathering crowd. In case you missed it, you can check it out in our own gallery and read about the artists in the press release after the jump. 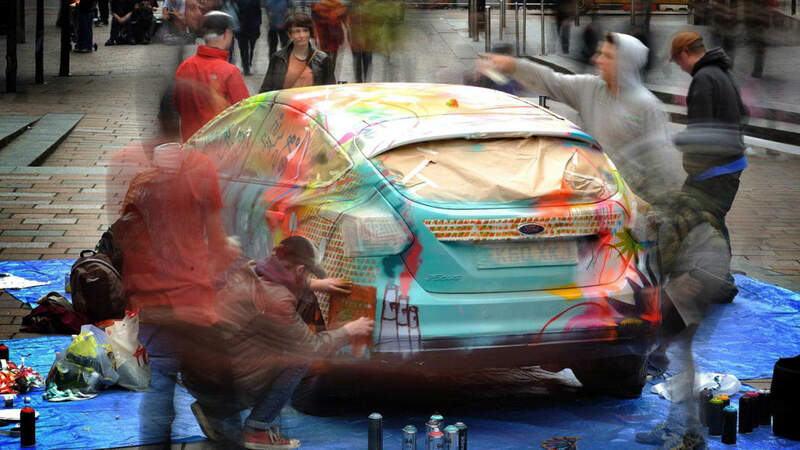 Glasgow, Scotland, 24 August, 2011 - Six street artists brought Glasgow City Centre to a standstill yesterday, transforming a brand new Ford Focus into a four-wheeled, vividly-coloured work of art. Working from a temporary public 'studio' outside the Glasgow Royal Concert Hall in Buchanan Street, the artists Lyken, FiST, Syrkus, Rue 5, Death Rattles and Al White, who are from the city's Independent Recoat Gallery, spent six hours producing the artwork that will now be featured for the next month, as part of the Ford Centenary Tour. Recoat Gallery manager, Amy Whiten, said: "The artists we have at Recoat have been doing great work in Scotland and we are delighted to get the chance to show what we can do. 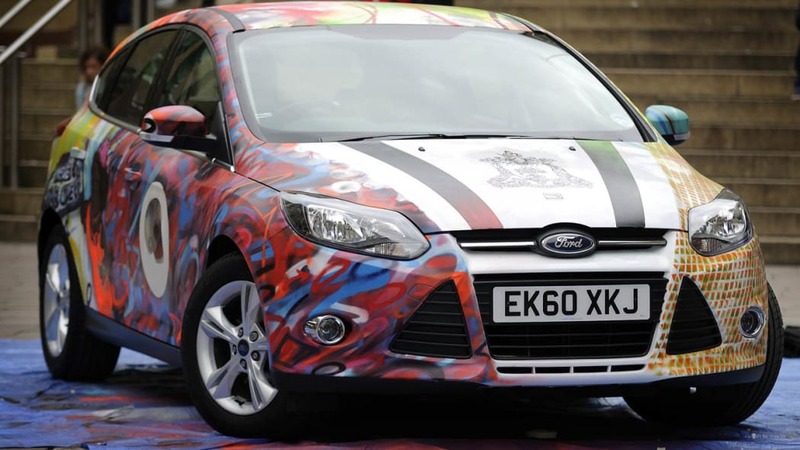 We've worked on a few different vehicle projects but this is the first time the artists have collaborated on completely restyling the paint job of a car." The Ford Centenary Tour is an exhibition charting the company's unique history in the UK and its future plans. It will visit 20 UK locations, including Ford plants and dealers, as it makes contact with Ford customers, employees and enthusiasts from Inverness in the Scottish Highlands to Plymouth on the south coast. The tour, which got underway in London last week, runs until September 18, finishing at the Goodwood Revival in Chichester, West Sussex.